PYEONGCHANG -- Korea's Sin Eui-hyun finished fifth in the men's 15-kilometer sitting biathlon event at the PyeongChang Winter Paralympic Games on Friday. Sin clocked 52 minutes, 20.7 seconds to finish fifth among 17 competitors at Alpensia Biathlon Centre in PyeongChang, some 180 km east of Seoul. Sin's compatriot Lee Jeong-min was seventh at 54:07.1. Sin was the interim leader until the 5.9km mark. He, however, missed two shots in his second prone shooting and slipped to 10th. The 37-year-old managed to climb up to fourth with his skiing but missed one shot in his last shooting and settled for fifth place. Martin Fleig of Germany won the event with a time of 49:57.2, followed by Daniel Cnossen of the United States at 50:42.7. Collin Cameron of Canada took bronze at 50:59.1. 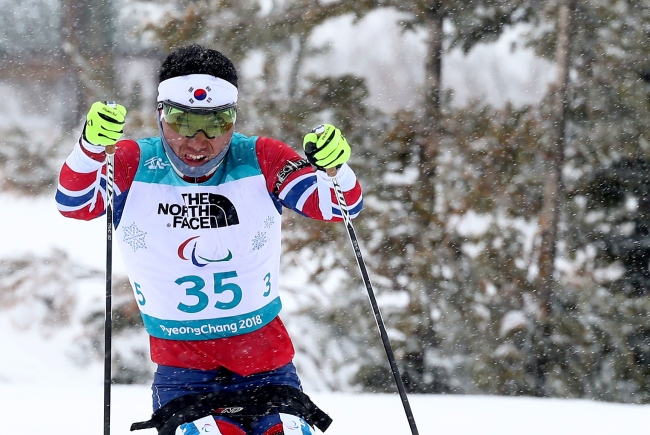 Sin was looking to add South Korea's second medal at the PyeongChang Paralympics. He previously delivered the host nation's first medal by taking bronze in the men's 15km cross-country skiing event. Sin is scheduled to compete in two more events: the 7.5km sitting cross-country skiing on Saturday and the 4x2.5km open relay cross-country skiing event with Lee and Kwon Sang-hyeon on Sunday.